Avangrid earnings jumped more than 25% year-over-year in the third quarter, mainly driven by increased gross margins for renewables and new transmission rate plans. The company posted net income of $125 million for the quarter ($0.40/share) versus $95 million ($0.32/share) a year earlier. For the first nine months of 2018, net income was $476 million ($1.54/share) against $458 million ($1.48/share) in the first three quarters of 2017. Avangrid’s 800-MW Vineyard Wind offshore project signed 20-year contracts with the Massachusetts Department of Public Utilities in August. CEO James P. Torgerson said during the call that subsidiary Central Maine Power had obtained FERC approval for transmission service agreements for its New England Clean Energy Connect (NECEC) ahead of schedule. The project would bring up to 1,200 MW of Canadian hydropower to Massachusetts. “Both Vineyard Wind and NECEC are on track, and we expect all permits and final approvals in 2019,” he said. The Vineyard project, a 50/50 partnership with Copenhagen Infrastructure Partners, calls for development in two phases. The first 400 MW will be operational at the end of 2021 for $74/MWh, with annual escalations of 2.5%, while the second phase, slated for a 2022 operations date, has a price of $65/MWh, again with 2.5% annual increases over 20 years. Torgerson said both phases are eligible for investment tax credits and capacity payments. The company is looking at “significant additional opportunities for offshore wind” in Massachusetts, New York, Rhode Island and farther south, he said. 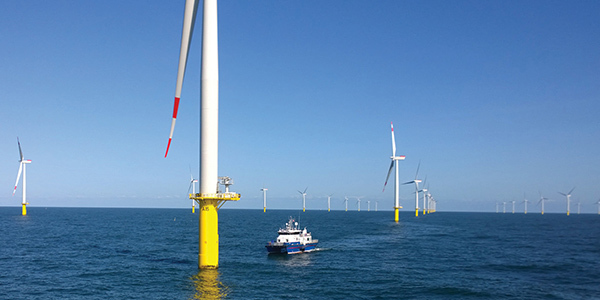 Avangrid has a lease on 122,000 acres 24 miles offshore Kitty Hawk, N.C., enough for 2.4 GW of wind, and has secured a position in PJM’s queue to interconnect three planned 800-MW projects near Virginia Beach, Va. The development process “is moving a little quicker now” because of Virginia’s plans to solicit up to 2 GW of offshore wind by 2028, Torgerson said. Avangrid also expects to bring 970 MW of onshore wind and solar into operation by the end of 2019 and estimates 2.7 GW of renewables development through 2022. The Maine PUC also recently found that CMP acted reasonably in preparing for and responding to the major storm that occurred in October 2017, and at the same time ordered the utility to file a rate case by Oct. 15. “We asked for a $24 million rate increase; however, there won’t be any rate impact to customers as we use some of the tax reform liabilities and file that back to customers, so they won’t see a rate increase; yet we will get the ability to earn another $24 million in revenue at least,” Torgerson said. Quotes courtesy of Seeking Alpha.